A performance management system is a process of developing a work environment or atmosphere which motivates employees to use their best of skills and work more productively. The main aim of doing this is to encourage the employee to work even better which can lead to growth and development of the organization. Most often the experience of performance management is not an amazing one; when someone else manages others or is being managed by another person; it is stressful and lengthy. Performance Management has both positive and negative aspects and bad performance management affects both the employees and the managers. Likewise, the proper performance management is always pleasing to both the employees and the manager; the performance management system is created for appraising the competence, output and contribution of all the workers. In this way, the managers can control the functioning of their companies and guide the employees to work in accordance with the demands and requirements of the companies. It helps to decide and produce a definite number of goods per unit of time, which will be most favourable to the business and growth of the company. Most of the professionals and experts in the industry misinterpret performance management as some kind of appraisal system or performance appraisal program. It is not any kind of system which helps in measuring the performance of the employee rather is a process of providing the employee’s required resources so that they can perform better at work. The performance management process is very important as it helps in gathering and combining the complete information which is derived by the process of discussion, feedback and monitoring. It is this information which helps to sketch out development and growth plans for the organization and solve employee problems (if any) and aid them to work even better. Though these components are important for every performance management system but is not mandatory as components alone would not make any changes. There are many other performance management systems which have been working well without any components. Prepare a clear job description based on the employee recruitment system of the hiring team. Schedule multiple levels of the interview to assess the candidate well and to make sure that they fit the position right. Teach them about the exit interviews so as to understand why employee Quit and leave. Like any other technique of management; employee performance management system also has advantages and drawbacks. Let us see some of the pros and cons of performance management systems. The popular concept of performance management is lengthy, unnecessarily complex and hectic; but in reality, performance management is essential for properly controlling a company. Effective and well-planned performance management is worthwhile for both the employers and the employees; as through performance management the regular small mistakes and petty negligencies can be spotted and therefore rectified easily. Managers and the authority often get too busy and overlook the small insincerities in the workplace, but these small mistakes can affect the company’s performance in a dire way. With performance management, the employers take regular feedback and often have performance-based interactions with the workers so that they can properly evaluate. The performance concerns are discussed between the employees and the employers; this interactions and discussions creates awareness amongst the employees about the problems faced by the company; so they try to rectify the problems and in this way, the company’s growth is achieved. All companies should always try for the progress of their employees; as the workers join a company to achieve development in their field of work and it is the duty of the organisation to guide the employees and assist them in achieving efficiency and competence. This is done best when there is performance management in a company; when it is followed properly all the inefficiencies of the workers can be observed and rectified through suitable measures. Thus performance management is a significant part of successful company planning. The performance evaluations should also be accompanied by some celebrations and emphasis on the positive aspects of the workers; criticism should be accompanied by approval to encourage and cheer-up the workers for doing better. During the performance appraisal sessions in performance management; all confusions should be explained and proper researches should be done on the difficulties so that suitable solutions can be given to the workers. It is better to solve difficulties soon after they are observed and not to wait for the annual evaluations; hence the company will have a better growth rate. The strategy of positive and encouraging evaluations is that it highlights the desirable traits of the worker and subtly tries to rectify their errors. One of the best advantages of performance evaluation is to get to know the areas for improvement of the individual. The remunerations and bonuses given by the companies to the successful workers act as effective incentives to inspire the workers for better performance. The employees will correlate their remunerations with the appreciation of the company for their hard work. Along with words of encouragement from managers and seniors; the monetary incentives inspire the workers to perform better. There will be some workers who are insincere and lack the commitment to perform as required by the organization. Performance management helps to identify these under-performers; after a performance appraisal, these under-performers can be listed and then the managers and the authority may take the decision of what to do with them. Either these workers should be asked to work following guidelines of the company and give the necessary effort or the insincere employees would be removed as they always slow down the progress of the company. When performance management is there in an organisation; the performance history of all its employees are documented. This document is stored in the employees’ HR folder; by keeping this document the progress of the employee while working in the company can be traced. Also if the employee intends to work in a better company this document will be immensely helpful; as his progress and growth, hard work can be observed in the document. Performance Management evaluates the progress of employees; the interactions encourage workers and lead to the birth of new ideas which will help in the progress of the company. The effective performance management helps the employees reach their fullest potential; the managers give advice to the employees for betterment. The efficient workers are professional and disciplined; performance management fosters these positive aspects. The companies follow the latest trends of the global commercial world and the management structures have specific purposes which create developments in the company. All flourishing organizations have performance management and the more successful the organization the better the performance management. The main objective of performance management is to better the functioning of each worker and consequently the progress of the whole organization. If performance management is appropriately applied, the errors of the employees will be identified and solutions would be given also praises are bestowed on the achievements of workers. If directives are given to workers about their responsibilities in the company it will directly affect the performance of the employees and indirectly will affect the success of the company. Through research and performance management existing problems are solved and precautions are taken against future problems these measures will ensure a better future of the organizations. Performance Management provides both the employees and the employers with valuable career insights and real professional information which is immensely valuable when one takes career decisions or does career planning. The strong points and aspirations of employees can be clearly discerned through their performance management documents and the employees can take future career decisions depending on this. The performance management files consist of the employees’ professional objectives, his career plans, his achievements and his weaknesses and also the manager’s opinion about him as an employee of the company. It provides both official training and progress plans based on the performance outcome of the employees. The final requirement and condition of any job are the eagerness of the employee to progress and get promotion in the company. The progress of the employees is tracked by the Performance Management System and it decides who will perform better in what works; it selects the employees and gives them specific jobs according to their expertise and qualifications. In performance management it is suggested that the managers spend about an hour with each employee to evaluate their performance; so if the company or team consists of a large number of people, the process of performance appraisal becomes extremely hectic and difficult. It will take long hours to evaluate the whole department’s PA; then there has to be hours of discussions in the meetings to get solutions for the difficulties and errors of the employees. Sometimes the experience of performance management is unpleasant and stressful; it becomes an obstacle to the progress of the employee. The managers may discourage and dissuade the employees through performance management if overemphasize is done on the errors and mistakes of the employees and the achievements and often overlooked. Then the employees will feel that they are not given enough due for their hard work, their achievements; the company only highlights their failures without praising them for their achievements. Always performance management should be a process of constructive support, encouragement and a celebration of the achievements; the mistakes and errors should be subtly pointed out and solutions also should be provided to the employees. Often the situation is that the manager is insincere and does not keep proper records and notes on the performance of the employees; this will create a gap between the actual performance of the workers and the report of the manager. The manager will make the wrong performance management reports; this will create contradictory and misleading performance management reports of the employees by the company. It is important that performance appraisals and documentation are done timely and regularly; so that a faulty appraisal can be avoided. So one of the disadvantages of performance appraisals is that a faulty review in appraisal can turn out very negative for you. The company managers are often partial and favouritism is also practised; this hampers the process of performance management. This partiality can be counted as a benefit of performance management or during this process. Hence to keep away partiality from the PA is difficult as it is solely dependent on the senior and manager to remain impartial and unbiased to conduct a proper Performance appraisal. A faulty performance evaluation is the outcome of a manager who has preconceived notions and evaluates the performance of employees based on biases. Many companies commit errors while creating the guidelines and directives of evaluating the performance of their employees; these faults will make the performance management system of the company insignificant and meaningless. Standards which do not properly reflect the actual performance of the workers are futile. Thus if the system tracks the goods without evaluating the quality of the products then the whole thing is rendered meaningless. If there are any norms or conditions that allow the employees to take unethical advantages and achieve success; then the performance management is ineffective and the company will suffer a set-back for this. The ethical workers may be frustrated and lose their sense of worth when working under a faulty performance management system; and where unethical means are undertaken to succeed. Even when the company’s performance management is mostly unbiased; if the unethical employees achieve more success than the real hard workings ones; then people will get disillusioned and lose their faith in the Company. Performance Management involves a two-way communication system between the employers and the employees. So if the managers neglect the evaluations and are irregular in doing the performance evaluations then it will have a negative effect on the performance history of the employee and also his career success; if the employee feels that over-emphasis is given on his mistakes and errors and his achievements are overlooked; then he will lose the incentive to work hard and progress. Also, too much praise and celebration for success will also make the workers arrogant and over-confident; so a balance should be created and the company should function accordingly. Negative and positive performance reviews should be given in a sensible way; so that neither the worker is over-whelmed nor over-stressed; negative reviews should be given in a controlled fashion so that the emphasis is on improving the employee performance and not on rebuking him as a child is rebuked by the elders. The focus of evaluation should always be to ensure the development of the company and progress of the worker, so supervision should be given to the employees by the managers to avoid errors and solutions should be clarified if the requirement arises. In spite of giving enough thought and time to the directives of the company; they often have some drawbacks and when the rules are implemented in reality the negative aspects come to the fore. This happens due to the lack of management commitment and management understanding. The way to be successful in implementing effective performance management requires the sponsor of top Management workers and Line Management workers; so that the workers feel that the company is committed to the benefits of the employees only. Also, bonuses and incentives should be there in all organisations to encourage the employees for hard work and growth of the company. Every performance management system should link the activities and goals of the employees with the organization goals. To gain this strategic purpose, the system must be flexible and also should possess a few characteristics. The second most purpose of the performance management system is to build strategies that help employees to work better. Here proper monitoring and feedbacks are given at timely periods. These feedbacks help them to identify their weakness and the thing which are causing hindrances in their way. 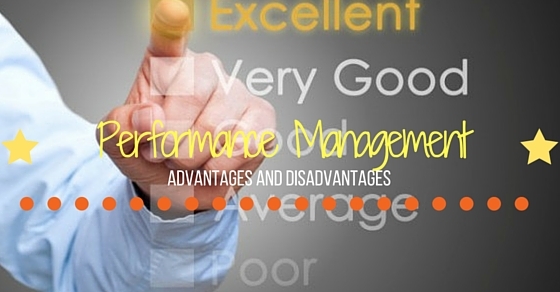 Here only some advantages and disadvantages and the importance of performance management system has been listed. There are much more which affect the performance of the individual workers and the overall growth of the company. When the advantages and disadvantages of performance management are seen; proper strategies should be implemented by the employers and the employees to get the best possible results.